Member of the Sigma Theta Tau Honor Society. Rachel was born in Jacksonville, Florida but moved all over the United States as a child of a Senior Chief in the Navy and returned to Tampa, Florida in 1994. She received her Associate of Science Degree in Nursing in 2005 from Hillsborough Community College and worked in Oncology and then went on to work in nephrology with the same physicians she is working with currently at Florida Kidney Physicians. 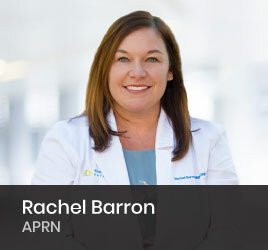 Rachel has a passion for educating patients, encouraging patients to be involved in their own care and empowering them to share their experiences with others. Her special area of interests is caring for patients in the nephrology outpatient setting with chronic kidney disease and hypertension, as well as working with patients who receive hemodialysis at the outpatient centers.